Get the legendary Vox tone with extra stage presence. The AC10C1 is an all-tube 10-watt amplifier that joins VOX's flagship lineup of tube amps, the Custom Series. More portable than the AC15 and more powerful than the AC4, the AC10C1 provides an array of classic VOX tones and comes equipped with studio-quality reverb and a master volume. The AC10 was one of the first amplifiers to bear the VOX name and was available only for a short period of time in the early 1960s. 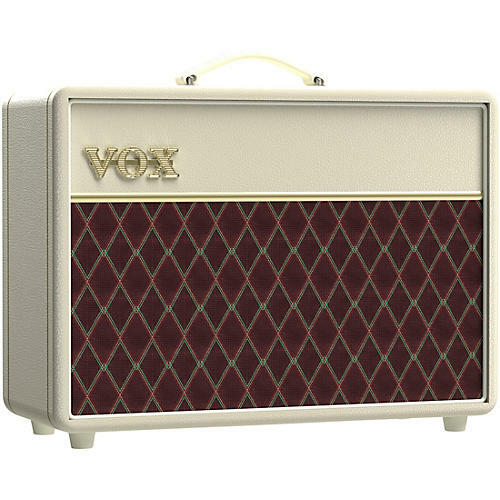 Long adored for its ability to achieve rich, articulate tube tone at very manageable volumes, the AC10 has become a highly coveted piece of VOX history since it's discontinuation in 1965. Now, in 2015, VOX is proud to reintroduce the AC10C1 and provide players with an easy way to enjoy the legendary VOX top boost sound. Enhancements include reverb and a master volume, the AC10C1 is the perfect companion for the home, studio or stage.